British embassy to reopen in Tehran Jump to media player The British embassy in Tehran is to reopen later, four years after it closed. British embassy to re-open in Iran Jump to media player Britain's embassy in Tehran is to re-open after it was closed four years ago. Iran plans to become tourist hotspot Jump to media player Iran is hoping the nuclear deal it struck with six world powers will help turn the country into a global tourism hotspot. How Iran sanctions affect daily life Jump to media player Amir Paivar from the BBC's Persian Service explains how the sanctions on Iran affect the economy. 'Iran can play more positive role' Jump to media player The Foreign Secretary William Hague has told MPs that Iran can "play a more positive role" across the Middle East. Iran 'will help Iraq if asked' Jump to media player Iran's President Rouhani says Tehran is ready to help Iraq in its battle against extremist Sunni Islamists, but sending troops is not on the cards. 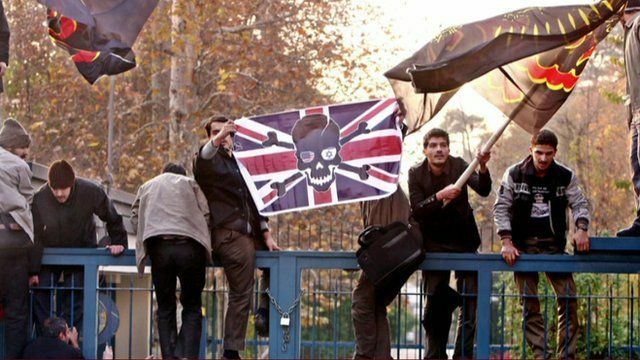 The British embassy in Tehran is to reopen later, four years after it closed. Foreign Secretary Philip Hammond will be in Tehran with a delegation of business leaders for a ceremony to mark the reopening. Iran is simultaneously reopening its embassy in London. Mr Hammond will be the first UK foreign secretary to visit Iran since 2003.